One of the books that’s on my kids’ reading list for a worldview class in their school this Fall is The Reason for God by Tim Keller. Anyone have any comment on what to look out for in that book, or better yet a suggestion for a better choice of book? It’s possible the instructor would be open to considering a different book. I strongly second Schaeffer, especially He is There and He is Not Silent. 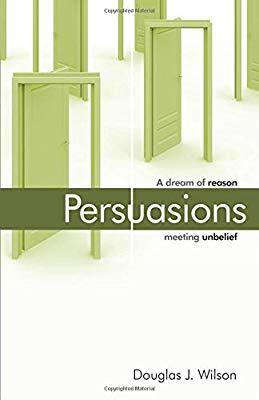 Another possibility, depending on what specifically you’re looking for, is Douglas Wilson’s book_Persuasions._ We just started using it homeschooling our oldest. Basically, it depicts a conversation between a Christian and someone else with a non-christian worldview (feminist, evolutionist etc.). This has the benefit of interacting well with a number of different groups, while still being a fairly short and enjoyable read. A third possibility, one we also use in homeschooling, is the books from the Apologia Worldview Curriculum. This are a little pricey new, but used copies are usually available online for cheap. The best option probably depends on age and level, with Schaeffer and Wilson books better for older kids, and the Apologia books better for 5th-8th graders. I read “the reason for God” quite a long time ago, but I remember thinking it was good. It’s where Keller’s at his most comfortable, engaging skeptics on a more abstract/philosophical level. I would be concerned if/when that replaces preaching the gospel to the unconverted, but as a conversation starter/apologetic type thing I think it’s fine. There will be better, deeper books - but that doesn’t make this a bad book! Thanks for the ideas, everybody. I appreciate it.